The Badminton World Federation mandated the official net height in 1934 and it has not changed since. The universally accepted net height, for singles and doubles play, is 5 feet in the center and 5 feet, 1 inch at the poles, which are situated just outside the court's doubles lines. 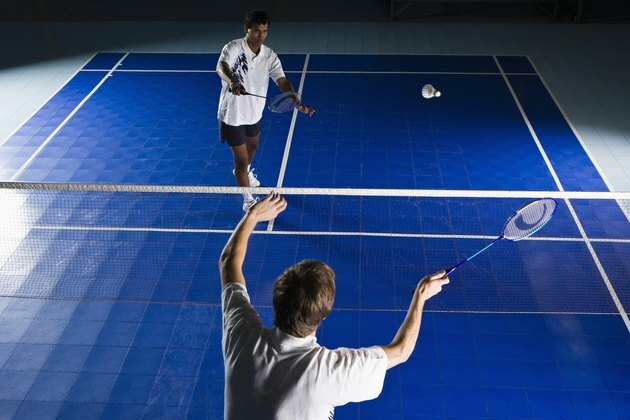 Players must clear the net with the shuttle within the confines of the singles or doubles lines for the play to be considered good. Much like tennis, one player for singles or two players for doubles stand on each side of the net. The first player or team to reach a score of 21 wins the game; a match consists of a best-of-three-games format. Each side of the court has a right and left service box; each game starts with the server in the right box and the receiver in the left box on her side of the court. The server then alternates the serve between the right and left side for the remainder of the game. The shuttle must clear the net and land within the lines in the receiver's box. Points are scored by the server or receiver when the shuttle touches the surface inside the opponent's court or either player commits a fault. What Is the Inner Box on a Soccer Field?